This is a table topper that I am making. It was "supposed to be" for a challenge for a quilt show at the end of July. I didn't get it completed it time. I used the "focus fabric" of the challenge in the vase. I am planning on using it also in a border, but haven't decided on that detail yet. 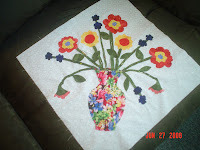 I love to button-whole stitch and that is how I am adhereing the vase, flowers, etc. to the white fabric. The pattern is from the Better Homes & Gardens Quilt Sampler Spring/Summer 2008 magazine. I wanted to make something similar to this for the challenge and when I flipped through this magazine, I saw this pattern and it is pretty much what I wanted to do for this challenge. The designer for the quilt in the magazine was Kathy Martin.